My macaroni and cheese recipe could qualify as a low calorie foods contender at only 480 to 610 calories per cup. Mac and cheese gets a bad rap because many versions either use pretend cheese or contain rivers of fat. Not so with this recipe given to me by a client from Edina, Minnesota. I've been using it for twenty years. My all time favorite mac and cheese and one of the all time fast, good and easy dinner recipes. LOW CALORIE FOODS TIP -- To reduce calories and fat, use low fat, 2% milk and less cheese. No- or low fat cheese is not an acceptable alternative, taste wise. Heat oven to 350F and butter a 2 quart casserole. In medium saucepan, melt butter over low heat. Whisk in flour, salt and pepper. Remove from heat, add a little milk and stir until smooth. Gradually add remaining milk, stirring well between additions. Return to medium heat and add American cheese slices and 1/2 cup cheddar cheese. Stir until mixture thickens and begins to boil. Remove from heat. 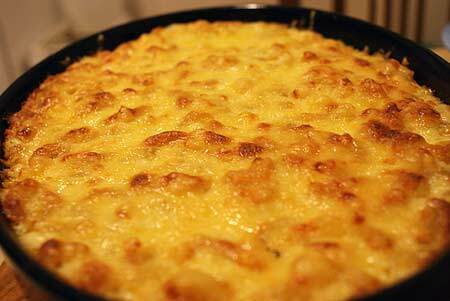 Stir macaroni into cheese sauce, pour into casserole and top with remaining 1 cup cheddar cheese. Bake uncovered for 30 minutes or until mixture is bubbly and brown on top. leave Macaroni and Cheese Recipe.